The great thing about engaging in a Nerf battle or war is that you dictate the rules and the overall feel of the game. For some, this means light-hearted play that is just for fun and features blasters that aren’t too rough or complicated for users on the battlefield. For others who are extremely serious about their Nerf battles, however, having a strong primary weapon is absolutely necessary in order to ensure survival and to make sure that they can compete against their equally dangerous opponents. This means leaving behind the slow-cocking, low ammunition blasters and breaking out the big guns, literally! 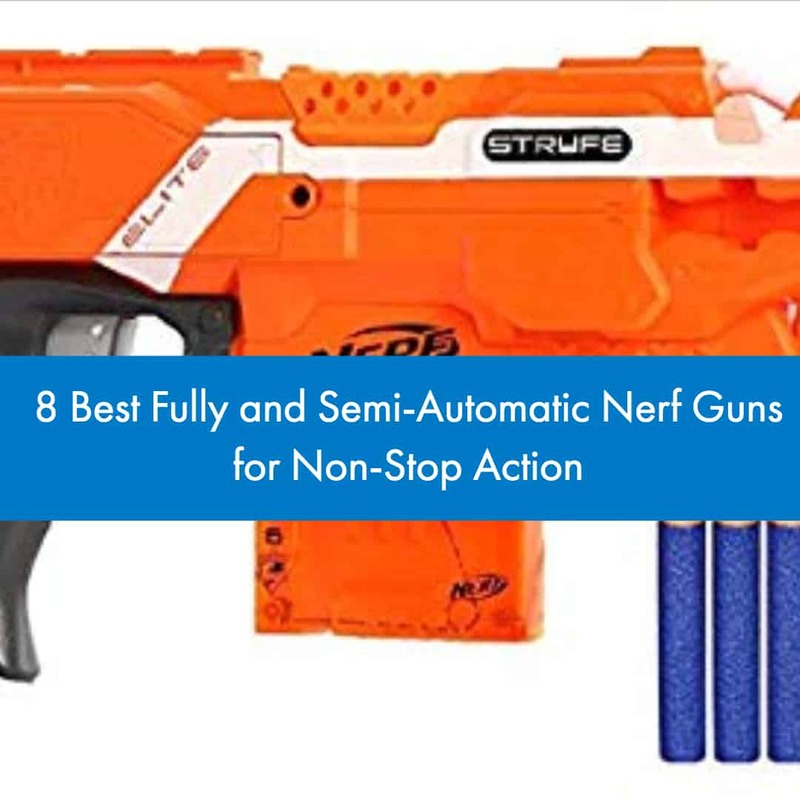 If you fall into the latter category and are in need of a gun that will give you an edge in any Nerf battle that relies on skill and gunpower, take a look at this list of the eight best fully and semi-automatic Nerf guns for non-stop action. We put together the list of fully before, if you are looking for FULLY ONLY, check out this article. It only seemed suitable to open up this list with one of the most popular and useful semi-automatic blasters offered by Nerf so we are going to start with the Nerf N-Strike Elite Stryfe Blaster. 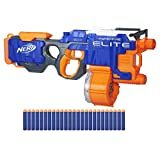 The Nerf N-Strike Elite Stryfe Blaster is a motorized, semi-automatic handgun that features a 6-dart clip system and a lightweight design that will work for Nerf enthusiasts of any age. Let’s start with some of the benefits that come with using this excellent piece of weaponry. The first is the fact that it works with every clip systems, meaning that you could easily modify it to handle more bullets so that you don’t run out of ammunition too quickly during a battle. These clips also make it easy to have extra ammo ready to go so that you won’t have to reload each time. The second benefit that comes with using this blaster is that it doesn’t require two hands like many other larger blasters that are semi-automatic or fully automatic, meaning that you could grab two of these handguns and operate them separately, making you a much more dangerous opponent on the battlefield. This blaster is very easy to use. Simply load the clip into the bottom of the blaster, hold the button down that is located below the trigger, and begin pulling the trigger when you are ready to fire your darts, which are expected to travel as far as 90 feet. When you’re out of ammo, replace clips and start the process again. The only thing that should be noted with this blaster and an issue that is often encountered with many semi-automatic or fully automatic blasters is that you may have to deal with infrequent jamming. These blasters are not immune to error and because they load and fire so fast, jamming may occur, especially if the clip or the ammo was not loaded properly. That being said, The Nerf N-Strike Elite Stryfe blaster is a great semi-automatic pistol that will make you a force to be reckoned with as you rush towards your enemies with two semi-automatic handguns in hand! The beautiful thing about some Nerf series are that they are highly customizable, making them versatile weapons in battle and giving Nerf users the ability to make their gun work in their favor. 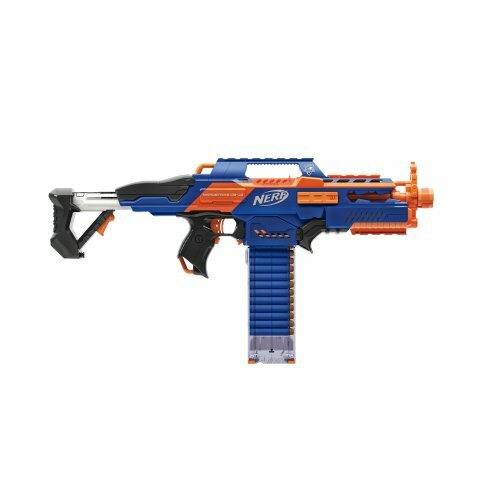 One of the most customizable lines produced by Nerf is the Modulus series and the second in our lineup is the Nerf N-Strike Modulus ECS-10 blaster. The blaster itself is similar in size to the previous product, making it more of a handgun than anything else. However, the initial kit that comes with the Nerf N-Strike Modulus ECS-10 when you first purchase it gives you a shoulder stock, a dual rail barrel, and a targeting scope that transforms it into an assault rifle. As we stated above, one of the biggest benefits of the Modulus series is that it is highly customizable. Although you do not receive many of the upgrades with your initial purchase, there are 30 possible weapon combinations that can be made with any of the additional parts that come in the Modulus series. This blaster comes with its own banana clip system that is capable of holding up to 10 darts at a time and can fire these darts at enemies up to 90 feet away, making it a very powerful semi-automatic weapon. To operate the blaster, load your banana clip into the bottom of the gun, hold the accelerator button that is located beneath the trigger, and pull the trigger to fire the darts. Like the previous mention, you can make sure to have pre-loaded clips ready to go so that you don’t have to deal with constantly reloading and chasing down bullets. The blaster itself is excellently designed but the only issue encountered with it and with many others on this list is that it often makes a lot of noise, which can be difficult if you are trying to hide during a Nerf battle. 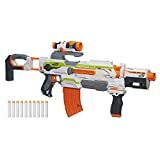 Besides this, the Nerf N-Strike Modulus ECS-10 blaster is a daunting weapon for your opponents to face and can be transformed to meet almost any of your personal needs. The Nerf N-Strike Elite Rapidstrike CS-18 blaster is the first fully automatic weapon choice on our list and is definitely a blaster that deserves all of the hype that it receives. To begin with, the Nerf N-Strike Elite Rapidstrike CS-18 Blaster is an extremely attractive piece with a sleek, transparent 18-dart clip and a vibrant orange and blue body that is designed with such detail that it looks very similar to the real weapon. Pushing past the excellent design aspects, the gun itself works brilliantly as well. Being fully-motorized, the gun can quickly empty itself at enemies up to 75 feet away at a rate of approximately 3 darts per second. The shoulder stock that comes with the gun gives the user improved accuracy while the transparent clip system gives users the ability to keep an eye on the number of bullets they still have left. Because the blaster utilizes a clip system that handles more bullets than the typical semi-automatic or fully-automatic blaster, it is a desirable feature that will allow you to preload your clips and quickly alternate between empty and full clips, giving you full, uninterrupted blasting power. Since it is fully-automatic, the batteries required to power it are much larger than the ones needed to power semi-automatic weapons and these weapons tend to go through battery power much quicker than semi-automatic blasters. If you are on the hunt for a fully-automatic blaster that is lighter than most but still capable of delivering a shower of bullets upon your enemies, you will be excited to purchase and use the Nerf N-Strike Elite Rapidstrike CS-18 blaster. The Nerf Rival Nemesis series utilizes these high-impact rounds and was made with serious Nerf enthusiasts in mind. 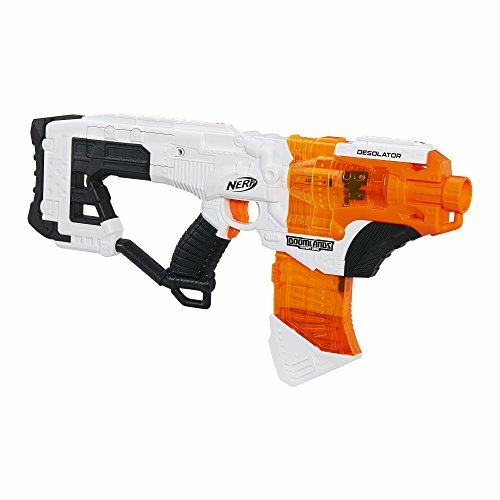 One of their blasters, which is one of the best of the series and is fully automatic, is the Nerf Rival Nemesis MXVII-10K blaster. 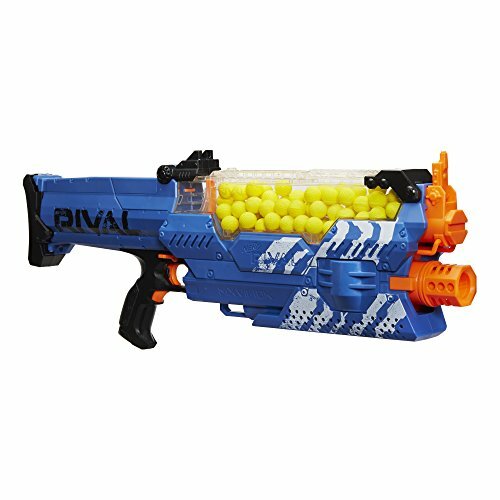 The Nerf Rival Nemesis MXVII-10K blaster is a large, fully automatic, fully motorized Nerf gun that comes in two different colors to help users separate into teams once they begin their Nerf battle. This blaster truly elevates the fully-automatic blaster game, featuring an ammo cartridge that is capable of holding up to 100 high-impact rounds, the ability to fire rounds at an impressive speed of 100 feet per second, and improved accuracy due to the high speeds of the launched rounds. The device itself is simple to operate and includes a trigger lock to make the rapid-fire experience that much simpler. The only downside to this blaster is that it is quite large and the weight is only added to when the 6 D batteries are put into the device. However, that shouldn’t deter you from looking into this next-level blaster. Are you trying to make your games more intense? If so, the Nerf Rival Nemesis MXVII-10K blaster will provide you with the speed, impact, and accuracy that you need to conduct a fierce Nerf blaster. For some, style is necessary and if you weren’t impressed with the Nerf N-Strike Elite Stryfe blaster, you may be looking for the Nerf Doomlands Impact Zone Desolator blaster. The Nerf Doomlands Impact Zone Desolator blaster is a semi-automatic blaster that operates in a similar fashion as the Stryfe, albeit with a larger clip and improved functionality. Along with the white design, the front of the gun is transparent as well as the top of the clip, allowing you to see the firing mechanism in action and keep track of how many bullets you still have left while you are firing them at your enemies. 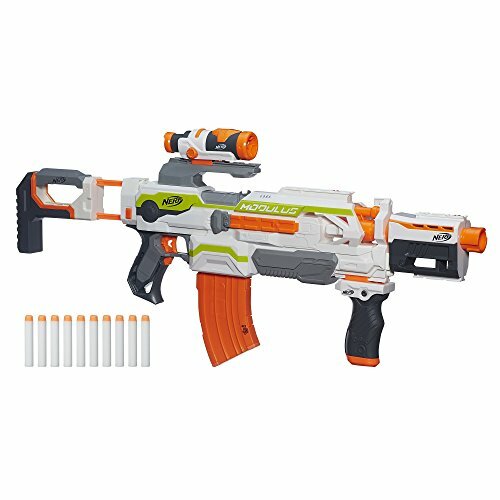 As stated earlier, the nerf Doomlands Impact Zone Desolator blaster functions in a similar fashion to the Stryfe, utilizing a 10-dart clip system and an acceleration trigger to launch your darts at will at targets up to 60 feet away. Some users have encountered the jamming issue that is typically experienced with the Stryfe but it isn’t an issue that debilitates the blaster. In need of a bigger assault rifle that can handle more ammo? Go for the Nerf Doomlands Impact Zone Desolator blaster. The Star Wars franchise is massive and it only makes sense that this franchise would eventually combine with Nerf products in order to deliver high-quality blasters that truly represent the spirit of the movie. When this eventually happened, we received the semi-automatic Star Wars Rogue One Nerf Captain Cassian Andor Deluxe blaster. The Star Wars Rogue One Nerf Captain Cassian Andor Deluxe blaster is a large blue semi-automatic blaster that comes jam-packed with features that make it a desirable weapon of choice for night games. At first glance, the design is quite simple. 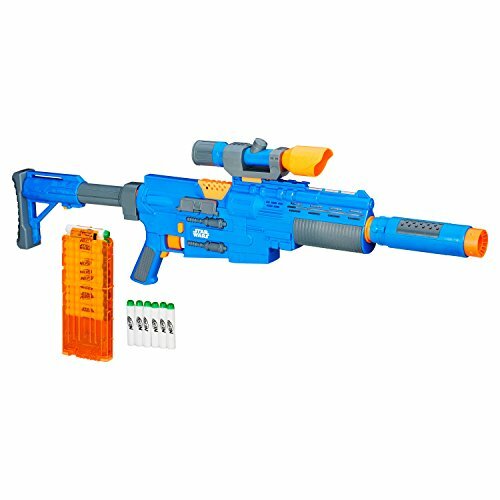 The bright blue body looks like a typical Nerf gun but with an added shoulder stock, scope, and barrel extension. When the lights go off, however, the area above the clip comes on to make the darts glow in the dark and a stunning bright green light that follows the course of your darts as they exit the gun. When it comes to function, the gun comes with a clip system that can hold up to six darts and an acceleration trigger beneath the firing trigger that helps to rapid fire your bullets. Users who have purchased this gun are extremely satisfied with its looks as well as its operation. Believe it or not, the guns that we have mentioned up to this point have been relatively docile in comparison to some of the other motorized products that Nerf has to offer. For these last two product suggestions, we are going to be providing you with monstrous guns that will make your opponents hide. For this seventh suggestion, we highly recommend the fully automatic Nerf N-Strike Elite HyperFire blaster. The Nerf N-Strike Elite HyperFire blaster may look like the rest of the N-Strike Elite series at first, sporting blue and orange colors and a design that makes the body look futuristic. 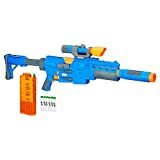 What differentiates this blaster from the rest in the series is the massive drum at the bottom of the gun, which puts it on almost all of the top Nerf automatic gun lists. This drum is capable of holding up to 25 darts, making it one of the few blasters that can handle the needs of a serious Nerf enthusiast. 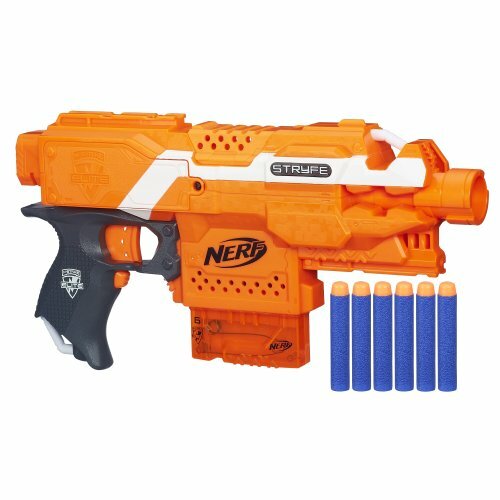 In addition to the amount of ammo it can hold, this blaster is also one of the fastest firing blaster offered by Nerf, capable of firing up to 5 darts at a time when the gun is using fully charged batteries. Once the bullets have left the barrel, they travel at high speeds and will be able to reach enemies at ranges of 90 feet. Operation is quite simple and only requires the user to hold down the acceleration button while firing. Much like other fully automatic blasters, this one will run out of batteries and darts rather quickly, which could prove a challenge if you do not have preloaded drums or batteries on hand. Still, that doesn’t bring down the overall quality and intensity of this blaster, making the Nerf N-Strike Elite HyperFire blaster a great option for those who want endless firepower that will scatter their opponents. Some enthusiasts may need a little more than the Nerf N-Strike Elite HyperFire blaster. I know, it sounds crazy that one would need something more than the previous product but during certain Nerf battles, it may be necessary. 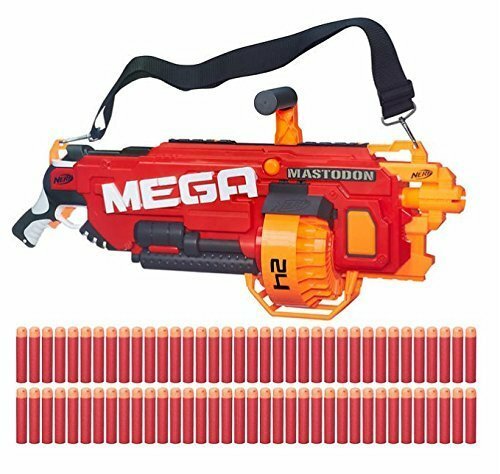 In difficult times such as these, reach for the Nerf N-Strike Mega Mega Mastodon Blaster. 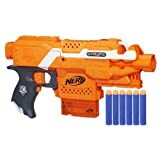 The Nerf N-Strike Mega Mega Mastodon blaster is the first motorized blaster in the Mega series and is a gun that will truly give you the kick you need to dominate any Nerf war. This Nerf gun utilizes a rotating barrel system to deliver bullets to enemies at ranges of approximately 100 feet away. This rotating barrel system makes it much easier to reload your gun when you’ve run out of bullets to fire and means that you don’t have to rely on massive clips to get the job done. Mega blasters mean mega sizes and mega bullets, making it harder for your opponents to dodge the bullets that you are raining down upon them. To handle the size, Nerf provides you with a shoulder strap and a handle that helps you to steady your weapon as you spray bullets across the battlefield. However, a large size means that this blaster is a little more difficult to handle and fire accurately and it will go through batteries quickly as well. 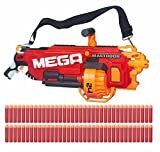 If you can handle these disadvantages, the Nerf N-Strike Mega Mega Mastodon blaster is a storm that your enemies will be unprepared for. Semi-automatic and fully automatic weapons are useful blasters for serious Nerf battles. If you are expecting to be a part of any upcoming Nerf war, take a look at some of the suggestions above to find a primary semi-automatic Nerf gun or fully automatic Nerf gun that will take your foes down with ease. That being said, we know how difficult it can be to find automatic Nerf guns that really outshine their competition. For those who are looking for a second opinion, use this YouTube video to get a better idea of how certain automatic Nerf guns function and which ones remain the kings in their categories.